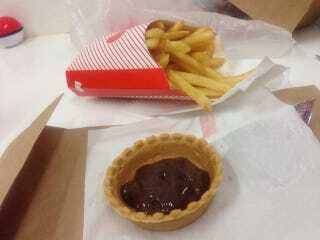 French Fries with Chocolate: Disgusting or Delicious? The idea sounds icky: Dipping french fries in chocolate sauce. But wait a minute! Sweet and salty? Hey, this might work. Or... maybe not. Last month, Kotaku reported that fast food chain Lotteria was rolling out "Dipping Fries" (つけポテ or tsuke pote) with Lotte's Ghana-branded milk chocolate. The chocolate is severed in an edible tart shell. You can see that above. You squirt the chocolate out of a little packet. Potato chips with chocolate are definitely a thing (not a mainstream thing!) and have gone on sale in Japan. So, in that regards, this isn't totally off-the-wall. Some of the Lotteria patrons who've posted images of the fries on Twitter certainly seem to enjoy the combination. Others don't! "Well, I tried the Dipping Fries," wrote one Twitter user. "I'm speechless." "Dis-gusting," wrote another Twitter user who ordered the fries. Some called them "questionable." Then, there were those who thought the French fries with chocolate tasted okay. "They're better than I thought they'd be hahahahahaha," wrote one. "The Dipping Fries tasted more delicious than I thought they would," wrote another, while there were those adding that they were "relatively tasty." Lotteria has released an array of interesting meals—such as bacon cube burgers, ramen burgers, as well as anime and horror movie inspired meals.